40mm 100% Silk Sheet & Set. 100% Silk Pillows & Blankets. Womens 100% Silk Tops Shirts. Womens 100% Silk Pyjamas Set. Womens 100% Silk Long Johns Set. 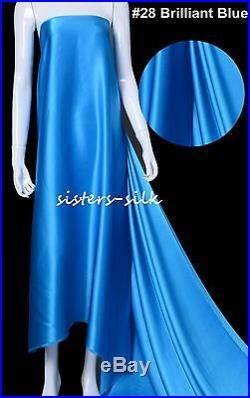 Womens 100% Silk Robes Gowns. Womens 100% Silk Bras & Set. Men's 100% Silk Clothing. Men's 100% Silk Tops Shirts. Men's 100% Silk Long Johns Set. Silk Eye Masks & Nightcap. 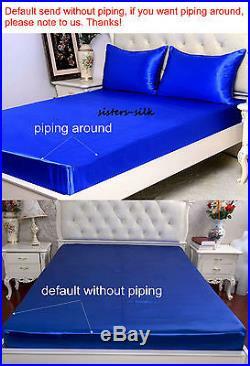 16 momme 100% pure mulberry silk duvet cover flat fitted sheet pillowcase set size double. "Pcs / set" Drop down list. 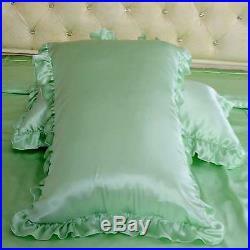 Double size bedding Item includes & dimensions. 1pc Pillow Case 20"x26". 1 pc pillowcase 20"x26" / 50x66cm. 3pcs Fitted Sheet Pillowcase Set. 1 fitted sheet 137x193x35cm+ 2 pillowcases 50x75cm. 3pcs Flat Sheet Pillowcase Set. 1 flat sheet 230x260cm + 2 pillowcases 50x75cm. 3pcs Duvet Cover Pillowcase Set. 1 duvet cover 200x200cm + 2 pillowcases 50x75cm. 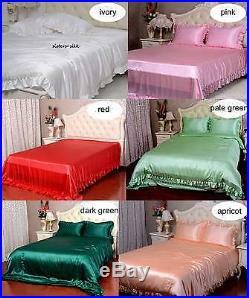 4pcs Fitted Flat Sheet Set. 1 flat sheet 230x260cm + 1 fitted sheet 137x193x35cm + 2 pillowcases 50x75cm. 4pcs Duvet Cover Fitted Sheet Set. 1 duvet cover 200x200cm + 1 fitted sheet 137x193x35cm + 2 pillowcases 50x75cm. 4pcs Duvet Cover Flat Sheet Set. 1 duvet cover 200x200cm + 1 flat sheet 230x260cm + 2 pillowcases 50x75cm. 5pcs Duvet Cover Sheets Set. 1 duvet cover 200x200cm + 1 flat sheet 230x260cm + 1 fitted sheet 137x193x35cm + 2 pillowcases 50x75cm. 16 momme 100% Mulberry Silk charmeuse. Brand new in package with tags. Made of 16 momme 100% mulberry silk charmeuse, it is luxury and beautiful. Has little ties downs inside that would attach to your duvet and keep it from moving around inside, and closed with zipper. Ruffled borders around 3 sides. Seamless on the surface, with elastic on the four corners, to ensure fit it onto the matress firmly there is one seam in the middle. One seam in the middle. 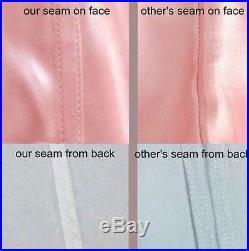 With 10cm hems on the head side, ruffled borders around 3 sides, there is one seam in the middle. Housewife style, you can use both side. Silk is long fiber, so it is very difficult to generate dust and have on human respiratory health role, particularly curative for use in patients with respiratory diseases. Detail please refer [about silk] below. How to maintain the silk bedding? Please wash with cold water no more than 30°C. Please don't wash with alkaline detergent, you can use neutral detergent or special silk detergent. Please don't dry clean. You can track your order through your own country's postal service's website if they have an tracking option available online. We always strive for high quality products and excellent customer service, your easy shopping here and satisfaction are the most important thing to us. The item "16Momme 100% Pure Silk Ruffled Duvet Cover Flat Sheet Pillowcase Set Size Double" is in sale since Friday, March 25, 2016.